This is my fourth published book of poems. Thank you for supporting me in my favorite past-time of writing. Since I began writing, I have been published in various poetry journals, papers and internet poetry sites. I have been a contributing writer to several internet based poetry sites and have poems published in several books of compilation. 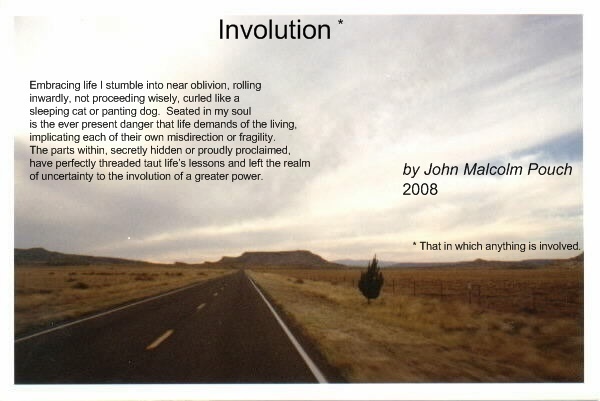 This latest work, Involution, is a collection of poems offering a different perspective on many subjects, such as Fumigation, Funeral for a Cat, Rumors, Middle Age, Climbing Stairs and many other subjects of everyday life. here in the forest halls. nor arrow shot in flight. by wild grass of green. the forest, so tall and serene. a man whom they belonged to. a woman who taught them. God whispered them lovingly to me. I lived my youth alone. Playing hide n’ seek long after dusk. The sky at end of day.